“A Very Hot Pot”is aresidency projecthostedby Hangzhou’s Inna Art Space, with additional supportfromSchool of Intermedia-Art (China Academy of Art) and the Swiss Arts Council Prohelvetia. Participating artists include: BigniaWehrli,Liao Wenfeng, Stefan Baltensperger and David Siepert. The residencylasts forone month. Inside this HOTPOT — the soup itself— between the ingredients a sort ofperpetual harmonisationof flavours and quality occurs — all these things (eventhe carbon-monoxide! )— make theircontribution. 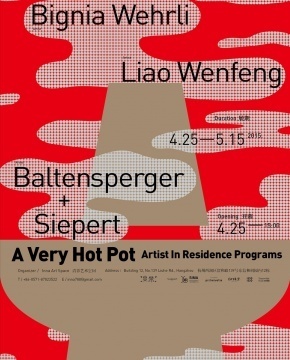 During the one-month period of the Hangzhou SUPER-HOTPOT residency, theparticipating artists will find new influences — new inspiration maybe similarto afore-described Swiss HOTPOT happening — something thatwill make themvery activeartists within their current living situation –the China of today! The setting we imagine for the forthcoming exhibition itself might bethought of as constituting a sort of perpetual occurrence — a happening initself — something like the boiling soup of a HOTPOT. During this residency the artists will bring in their own ideas of artand will transform their experiences in their respective artistic practice.Accordingly the final exhibiton has to be seen as a gathering of transformedexperiences, influences and ideas – A narrative entity born out of manyconversations and various kinds of translations.